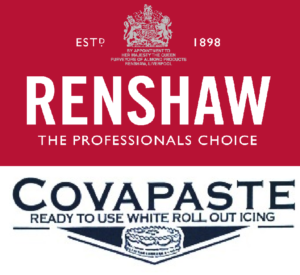 Renshaw ready to roll fondant icing can be rolled out, hand modelled, or used with cutters & moulds – perfect for covering & decorating cakes, cupcakes & cookies. 250g pack sizes, some colours also available in larger packs. ABOUT: Fondant icing is the ultimate cake maker’s tool. You can use it to decorate cakes of all kinds, cupcakes and cookies, to create models and decorations or use it in kids’ craft. The possibilities are endless. 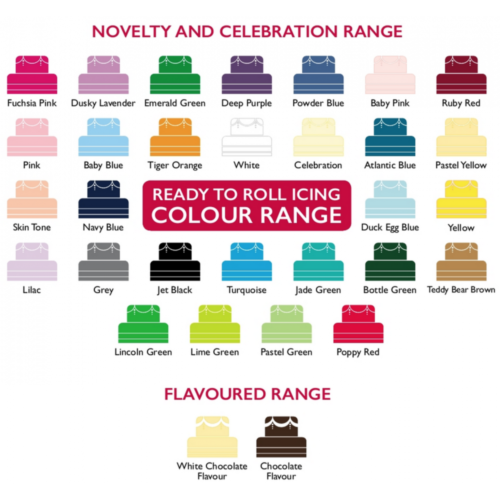 Renshaw fondant icing is available in white, celebration and an unrivalled palette of 34 colours which means that you can make anything from the purest four-tiered wedding cake to amazing celebration cupcakes. PREPARATION: To get the best from our fondant icing we recommend kneading it on a hard, dry work surface before dusting the area with a light coating of icing sugar. Then grab your rolling pin and using firm, even pressure roll the fondant icing out. Our recipe means that when you use the icing to cover a cake it will remain soft on the underside but will firm up on the top, which will allow for easy decorating on top. We think a thickness of 3 to 4mm makes for the ideal cake covering. STORAGE: Our icing products are available in a variety of pack sizes, from 250g up to 10kgs, which means you can get the right quantities for your project. Once opened, it’s important to store the icing in a zip-lock bag or airtight container to keep it in perfect, workable condition. Renshaws ready to roll fondant icing can be rolled out, hand modelled, or used with cutters & moulds – perfect for covering & decorating cakes, cupcakes & cookies. 250g pack sizes.